Deezer has announced that an updated iOS app —coming later on Wednesday —will allow iPhone owners to control the music service via CarPlay. In addition to specific songs, albums, and playlists, CarPlay users will also be able to access themed Mix channels, and tune into the Pandora-like Flow, according to an official blog entry. 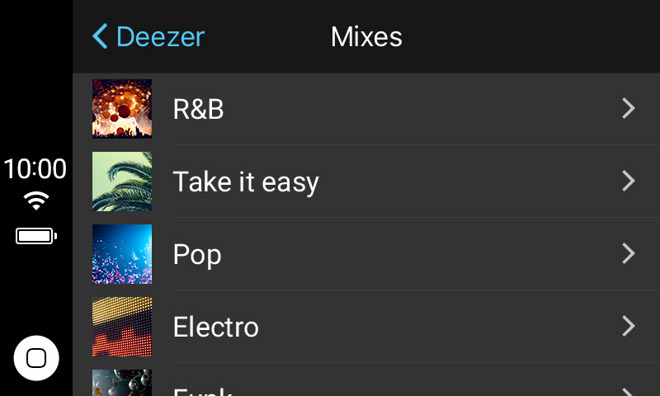 As with Pandora, Deezer listeners will be able to up- or downvote tracks while driving. The update will also push the app's requirements from iOS 7 to iOS 7.1. In the U.S., Deezer is currently available only through Bose, Sonos, or Cricket Wireless. The company is working on broader American availability. Relatively few third-party apps are compatible with CarPlay, despite the platform having launched in March 2014. Even Pandora —a mainstay of many carmakers' entertainment systems —only came on board in October. Some other compatible apps include Audible, Overcast, Spotify, and Stitcher. There are in fact more compatible vehicles than apps, now that carmarkers like Honda and GM are rolling out supporting models. Most recently Volvo announced its first compatible U.S. vehicle, the 2016 XC90.